Wilmer Martinez is the President of the Accounting Association for the Spring 2019 semester. Wilmer graduated from Downtown Magnets High School in 2015 and directly started his college career at CSUN. Being the first in his family to attend college, he was nervous but excited to start finding the career he wanted to pursue. 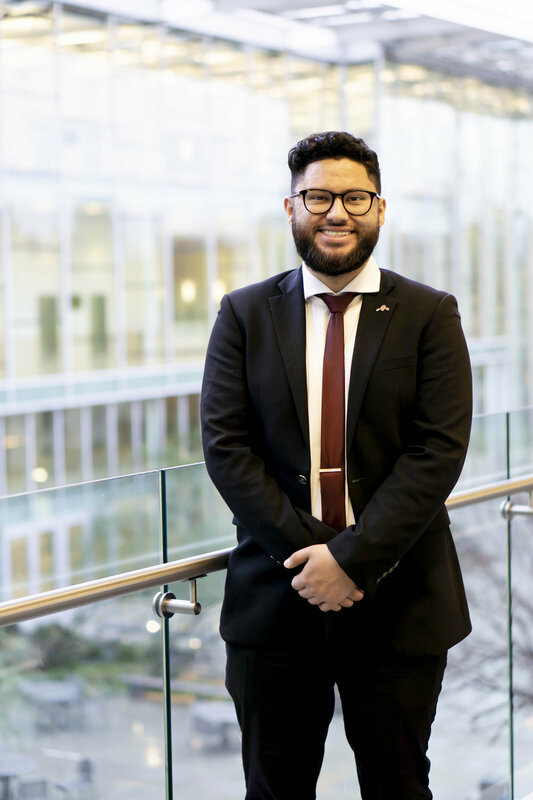 For the first two years of college, Wilmer would attend class and commute an hour back home, never getting involved or being motivated to learn more about the accounting career. With the help of Accounting Association and his mentors in the club, he was able to gain the confidence to attend meetings and Meet the Firms during Fall 2017 and was able to successfully land an internship on his first try. His mentors encouraged him do a Student Activities directorship the following semester where he showed his dedication to improving his organizational and creative skills. 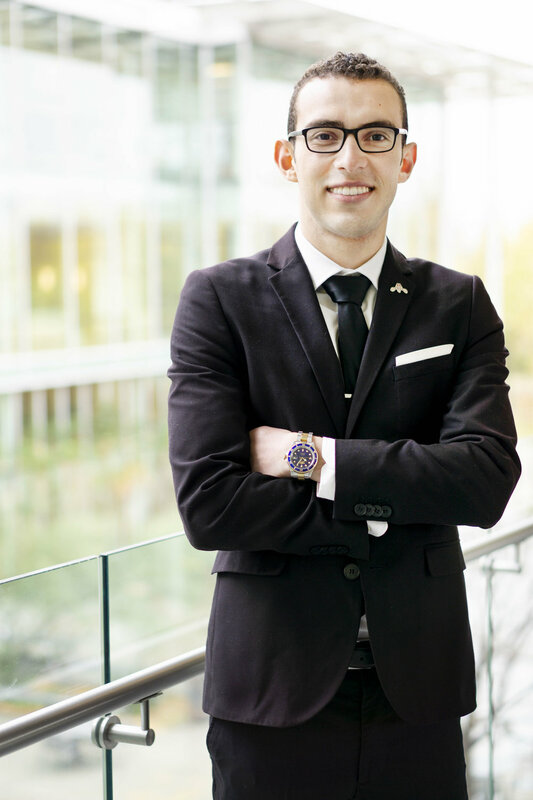 In Fall 2018, Wilmer took a step further and became an executive at the Accounting Association. The position helped significantly improve his leadership and delegation skills while overlooking two directorships. With the help of the Accounting Association, he was able to do the Start Internship with PwC during the Summer of 2018 and will be returning in the Summer of 2019 as a Tax Intern. He is excited to continue his growth with both PwC and Accounting Association this coming semester. During his free time, Wilmer loves helping others who are confused on how to successfully be a college student, playing and watching video games, and making constant puns. Faith Sevilla is the Vice President of the Accounting Association for Spring 2019. Faith Sevilla transferred to CSUN in Fall 2016, but wasn’t actively involved with club activities until Fall 2017. When she became a club member of the Accounting Association, she saw how people cared and helped out each other through the recruiting process, networking events, and accounting classes. One of the things she appreciated the most from Accounting Association was that they were able to understand how she was a different person with an extremely outgoing, loud, friendly, and crazy personality. When the directorship application was sent out at the end of Fall 2017, she decided to apply for the directorship position. In Spring 2018, she became one of the Marketing Directors where she was able to better her organizational and leadership skills. For Fall 2018, she became the Executive of Operations for AA and because of her strong personality, eagerness to learn, and leadership skills, she was able to oversee 9 Directors last semester. This Spring 2019 semester, she will be around campus helping out her Meet the Firms and Mentorship Directors while volunteering at the VITA clinic and working as an intern with RSM. Faith likes enjoys having a busy schedule and being productive. When she’s on vacation, she backpacks for weeks and goes to different places by herself. She’s very independent and strong-minded. Backpacking to many different countries and living like a local made her appreciate little things she has that other people might not and made her understand that getting lost is fine because it will help you find yourself and be a better person. She likes getting out of her comfort zone and trying new things because she believes that pushing yourself to be uncomfortable and not limiting yourself will take you far in your personal life and career goals. If you see her around, talk to her! Steve Morales is the Advisor of the Accounting Association for Spring 2019. Steve Morales graduated from Van Nuys High School in 2013 and went Pierce College for 3 years. He transferred from Pierce College and started at CSUN in the Summer of 2016. Being the first one to graduate in his family, he was eager to start. With this motivation, he reached out to his fellow peers and faculty in order to get help in exposing himself to the recruiting world at CSUN as well as the Accounting Association. As the director of Web Development in the Spring 2017, he was able to better his knowledge on how the AA website worked, and he honed his communication skills by having the task of sending out emails to all members as weekly reminders. His role as the director of Student Development in the Fall 2017 bettered his time management skills and his public speaking skills. He managed two main events that AA hosts such as Resume Workshop and Mock Interviews. He also was the Executive Administrator and finished his last semester as President for the Fall 2018z Throughout his journey in the Accounting Association, Steve was given the opportunity to be a Launch intern with EY in the Summer 2017. He was given the privilege to travel to New York and attend their Discover EY conference event. He is excited to continue his growth with EY, as he was a tax intern for the Summer 2018 and now starting full time as a Tax Associate at EY. During his free time, Steve loves watching anime, photography, and being a mentor to help transfer students and students in the LGBT community. Brianna Alonzo is the Controller of the Accounting Association for Spring 2019. Brianna attended Downtown Magnets High School in the Academy of Business and Finance where she became interested in accounting. She started CSUN in Fall 2017, and with a commute drive from Los Angeles to Northridge she felt the need to be more involved on campus. She found the Accounting Association and quickly became involved. During her first semester in college, she recruited for the first time and received an offer with KPMG to attend the Future Diversity Program for the summer. Through this program, Brianna was able to receive an offer to do the Embark internship for this upcoming summer. She was the Awards Banquet director for Spring 2018, and the Student Development director for Fall 2018. With the guidance of her executives and co-directors, she was inspired to take an Executive position to hopefully impact other students like they did for her. With her new position as Controller, she hopes to help other students seek opportunities and understand the recruiting process. Brianna is excited to see this semesters team of Accounting Association help other students shine and grow. Jason Unger is the Accounting Association’s Treasurer for the Spring 2019 semester. He began attending Santa Monica College in Fall 2015 as a Biology Major with the intention to later attend medical school. After realizing this was not a good fit, he took an accounting class because it sounded interesting and stuck through the program. He later transferred to CSUN in the Fall 2017 semester. After listening to an announcement made to his Accounting 350 class, he decided to join the Accounting Association as a member that same semester as an opportunity to learn more about the accounting profession and as an opportunity to connect with other students. The following semester, in Spring 2018, he felt inspired by the mentors he met through AA and decided to become active within the organization by assuming the role of Wednesday Meetings Director. In Fall 2018, he continued with the organization as Charitable Events Director. This semester, as treasurer, Jason is excited to work closely with the membership directors to see how the organization can create a more interactive environment for students and promote inclusivity; he is also looking forward to scheduling firm tour opportunities for students to improve their professional network and experience professional growth. In his free time, Jason enjoys playing guitar. A fun fact is he sings “Gasolina” well. Tananya Sitiso is the Executive of Operations of the Accounting Association (AA) for Spring 2019. After graduating from Granada Hills Charter High School (GHCHS) down the street, she started her undergraduate career at CSUN in Pre-Accountancy. Life as a freshman and sophomore wasn’t too exciting because she would just go to school for classes and head home. She didn’t have any aspirations to join any clubs. In Fall 2016, she participated in the National Student Exchange program. She got to experience life in the Mid-West and the accounting program at another campus. After attending the University of Wisconsin-Eau Claire, she realized how great CSUN and it’s accounting program is. Many resources are offered that student should really take advantage of that. When she got back from exchange, she remembers AA coming to present in her ACCT 350 class, but still didn’t feel the need to join the club. During the summer of 2017, she started working at the headquarters of a manufacturing company as the Finance/Accounting Intern. Her responsibilities includes assisting the Enterprise Resource Planning project, AP/AR, finance, and the senior accountants. She didn’t want to graduate from CSUN not being able to impact the campus in some form. For her last year as an undergrad, she wanted to increase her campus involvement and make new friends. Being completely ignorant, she decided to apply for the marketing directorship for AA in the Fall of 2018 and regrets not joining earlier. She enjoyed meeting new people, expressing her creativity, and establishing genuine friendships. Although she has developed many skills as intern, she felt that she gained many other skills as a director that she wouldn’t have been able to achieve in her internship. For Spring 2019, she wanted to continue her journey with AA as an executive and help other students develop skills that will help them succeed as business students and professionals. Her hobbies include photography/videography, DIY projects, and sports. Her (im)practical dream is to become an American Ninja Warrior and/or an Olympic Snowboarder. Vivian Dang is the Executive Administrator of the Accounting Association (AA) for Spring 2019. After high school she went to university in Northern California to pursue a degree in pharmacy however, she decided that pharmacy wasn’t the field for her and moved home. She then attended Glendale Community College for one year where she earned an Associate’s Degree for Transfer in business administration and transferred to CSUN fall 2017 to pursue a degree in accounting. Having known nothing about the recruiting process during transfer, she joined the accounting association and from then began to participate in club activities. Vivian became the director of charitable events spring 2018 and there gained skills on how to work in groups and execute events to help improve the surrounding LA community. Through being an active member of AA, Vivian was able to gain valuable skills that helped her network and gain a Summer Leadership Program. During fall 2018 Vivian became the director of Student Development with the goal of helping other students advance their careers. 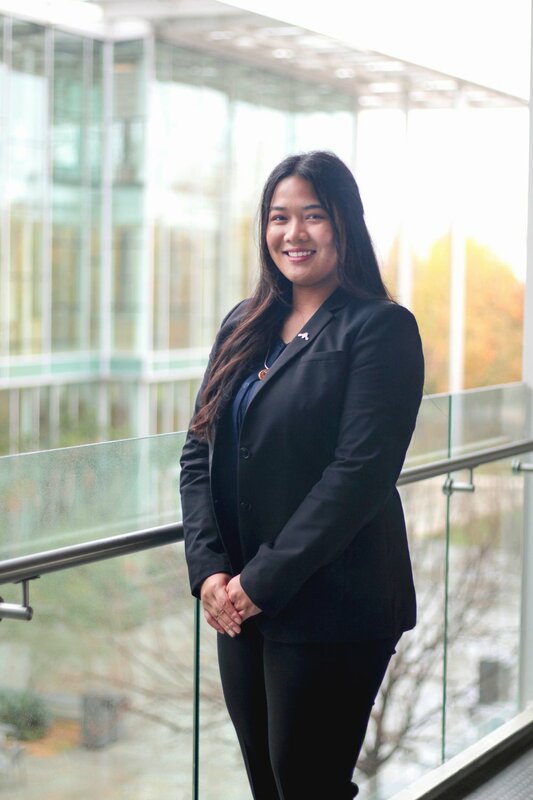 Vivian wished to continue to serve the accounting association and so applied for an executive position for spring 2019 and is now serving as its executive administrator. She hopes to make new connections and to continue to help students develop their networking skills through this executive position. Dina Sasoones is the Executive Coordinator for the Accounting Association (AA) for Spring 2019. She graduated high school in 2014, and started to attend Santa Monica College that same year. Her initial career choice was to be a chef and to own a restaurant. Thus, she majored in Business Management. Her plan was to attend culinary school after graduating with a B.S. in Business Management. After taking financial accounting [as a prerequisite], she changed her major to accounting and decided to be an accountant. She transferred to CSUN in Fall 2016. In Spring 2018, she was the Marketing Director for the Accounting Association. When the semester came close to an end, Fatima Batool helped her acknowledge her leadership skills, and she decided to apply for the Controller position of the Accounting Association for Fall 2018. During the summer of 2018, she had two internships. She was the Accounting and Finance Intern at The Bouqs, an E-commerce company. Her other internship was being part of the Stern Service Corp for Senator Henry Stern, who’s the Senator for the 27th District of California. She worked on a project, where they interviewed homeless women and posted the interviews on their Instagram page, @fearless.faces. Furthermore, they fundraised to gather sanitation products for homeless women as well. In her free time, she likes to spend time with her friends and family. She also likes taking pottery classes, cooking, and crocheting. This semester’s Executive Board of the Accounting Association is full of positive energy and welcoming faces, and she's excited to share this opportunity with everyone who decides to be part of it. Magali Rodriguez is the Executive of Student Relations of Accounting Association (AA) for Spring 2019. Magali’s first exposure to Accounting was in high school when she began working in the accounting department of a property management company. She attended Santa Monica College and Moorpark College before transferring to CSUN Fall of 2016. Magali became a member of AA and recruited for internships Fall of 2017. She took advantage of the workshops and firm tours to meet professionals and gain a better understanding of public accounting. Magali ended the semester with 3 internship offers and an increased passion for giving back to the accounting community on campus. The following spring, she became more involved by attending many events held by the clubs. Magali applied for an AA directorship at the end of the spring semester and landed the Student Development directorship for Fall of 2018. This is Magali’s last semester at CSUN and her goals are to mentor students and promote inclusivity. She is excited to continue her involvement in AA and meet new faces! Magali enjoys playing badminton, spending time with friends, and all things make-up!